Our office was meticulously crafted to provide unsurpassed comfort in a relaxed, modern and state-of-the-art environment, and we take pride in offering a wide-spectrum of services for your convenience. Dr. Makadia understands your time is valuable, striving to see patients immediately on arrival, and it is his ultimate goal to provide the care you want and deserve, with minimal pain, that’s always done right the first time. At Sunrise Dental Service, Dr. Makadia and our caring team are dedicated to helping you and your family attain optimal oral health and beautiful esthetics. Our practice serves Bohemia, NY patients, as well as Suffolk County’s surrounding areas of Ronkonkomma, Sayville, Holbrook, Oakdale, Blue Point and Patchogue. 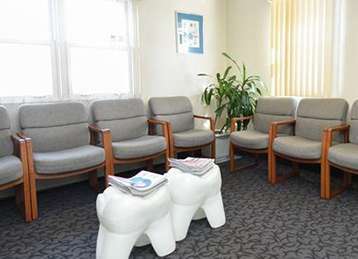 And, we offer it all – including general/preventive dentistry, cosmetic and restorative services, and emergency care. Our attention to detail is evident in the high-quality results we achieve for our patients, and we can’t wait to help you smile for years to come. see you the same day. Are you ready to meet a gentle, caring and skilled dentist? Call our office to schedule an appointment with Dr. Makadia. He will listen to your concerns, provide information, and explain treatment options in detail to you and your family.